LG has a great history with its flagships that can be summed up as a successful phase that was followed by the brand’s loss of prestige. From the G2 to the fabulous G4, LG was innovative and inspired other manufacturers. With the G5 and G6, we’ve seen how their sales have fallen and they’ve done nothing but try to get back on the innovation bandwagon. The G7 isn’t a revelation, but it is the right change to pick up where the G4 left off. In case you haven't noticed, I'm quite a fan of the old LG flagships. I miss the back button panel, I loved it. The G6 has something of that. I think it’s more of a free spirit. The G7 is new to the G series, but it looks like it’s taken a small step forward the V series. The G7 is longer than the G6, but retains the same width and thickness and is almost identical in weight. It’s more comfortable in your hand than its predecessor, which has a flat frame and more touch-sensitive edges. The back of the G7 is much more aesthetically-pleasing. The new position of the camera also helps. The two lenses with the flash separating them in between have a somewhat strange effect. The headphone jack has moved to the bottom, which I find most practical. One thing I don’t like about the G7 is the two additional buttons it has on the body: there’s one to turn on the device and one for Google Assistant and Google Lens. There are people who like the notch, people who don’t care, and people like me, who don’t even notice it. I don’t think it’s bad that Apple set this trend, but manufacturers need to use their best judgement. There are other ways to go about design. A very good example is the Mi MIX 2S, which nobody copies but should. The G7 has a long display. It went from 18:9 in the G6 to 19.5:9 in the G7. This has led to a longer diagonal and the display covers more than 82% of the frame (just a little less than the iPhone X). The number of pixels has increased for the vertical dimensions, but the pixel density has remained the same. The glass protection has been upgraded from Gorilla Glass 3 in the G6 to Gorilla Glass 5 in the G7. There’s better performance but what about updates? The G6 introduced in 2017 had the best processor from the year before, the Snapdragon 821. This was a point of considerable criticism. I guess that’s why the 2018 LG G7 ThinQ has the latest processor available, the powerful Snapdragon 845. The amount of RAM has been kept at 4 GB, although in some markets the G7 will also be available with 6 GB. Whatever the case, top-level performance is assured and with at least 64 GB of internal storage, you’ll have more than enough space because the device also has a microSD slot. It’s no secret, that despite the price drop, the LG G6 has not sold well. This factor may have greatly influenced how long it took the manufacturer to update the device. This has had negative consequences for LG’s reputation. Until recently, LG was one of the manufacturers that took upgrades most seriously, but in the last two years it has lagged behind. Let's hope that the G7 Android P upgrade will be faster and regain a little more credibility with users. Substantial improvements were made from the G6 to the G7 camera, including the implementation of artificial intelligence to improve camera performance and results. So far so good, but the G7 has a surprise that we weren’t very fond of. The battery power has been reduced by 300 mAh to 3000 mAh. Even though the processor is more efficient, I’m sure this shows. In the G6, the battery life was dismal and in the V30 (with the same capacity but a faster processor), it was a little better. First of all, let’s take a look at the prices. The G6 currently costs around $420 while the G7 has a starting price of $750 in the US. From the price and the improvements that the G7 offers, it seems to me that the V30S ThinQ is its biggest competitor. The G6 is not much of an alternative to compete, but at least it’s cheap and you get the quality of a flagship. 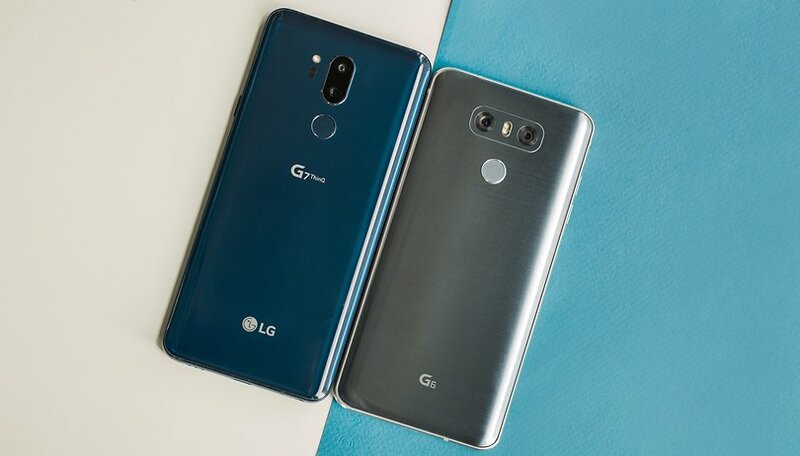 Choose “LG G6” or “LG G7 ThinQ”. there is nothing wrong with the G6 even though it has a slower processor. The 821 is fast enough for me and I am sure for most other people as well. Anytime I do anything on this phone it happens very quickly. You know there does come a time when enough is enough and the Snapdragon 821 more than handles anything that you can ask it to do. Again it is a very quick phone no lag time at all I barely touch the fingerprint sensor it is on instantly and ready to go. Great camera. Great phone. battery life on g7 is good! easily as good as my s9+. specs aren't everything. The real reason the g6 had failed sales it was released with the 821processer when Samsung was releasing the 835 in the s8. Still a good phone but consumers wanted the latest processor. Let's see how well the g7 will sell? Will the notch hurt it!